This is a dish you really need to try. If you don’t like bourbon, don’t worry about it. Baby Lady doesn’t like Bourbon either but she absolutely loved this preparation. As everyone knows (and if you can’t tell from glancing at the site) Baby Lady and I eat and prepare lots of fish dishes. As a general rule, Baby Lady doesn’t eat red meat. She eats some chicken, occasional pork (unless it comes to bacon), veggies of all kinds except cooked carrots, and seafood. I, on the other hand will eat almost anything, except liver. Seafood, however, is good for you with generous amounts of omega 3 fatty acids, is lower in calories, and there are so many different varieties and manners of preparation. The tough thing about seafood is it really is best when fresh (or relatively so). Living inland makes it harder to find fresh seafood. Nonetheless, we have a gourmet market that has fresh fish (not frozen) flown in daily. It’s always fun to go see what they have on hand that is fresh for the day. This last Sunday after we returned from our vacation we needed to buy some groceries so off to the market we went. As we were shopping we saw they had some beautiful, fresh Columbia River Chinook (King Salmon). I was extremely pleased to see it as we really like salmon, and to make things better it was on sale. So, I had to buy some and did. You see I have been wanting to make this dish for a while but every time I mentioned bourbon glaze Baby Lady gave me one of those odd stares like why would I do that to a perfectly good salmon. It’s a good thing I had already decided to fix the Spicy Ahi & Crab Poke Lettuce Wraps for Sunday dinner because I could make this while she was at work on Monday. It’s a simple and quick meal perfect for weeknight dinners. So, I made it and Baby Lady really enjoyed it. It really is delicious and we hope you give it a try. Now, while I was getting everything ready for the salmon, Baby Lady decided she wanted to have roasted asparagus as an accompaniment. We love roasting veggies. It brings out such tremendous depth of flavor and character. This is one of Baby Lady’s favorite ways to fix asparagus and it’s so simple. It also went well with the salmon. So, next time you have some asparagus in the fridge, try this technique. We are certain you will enjoy it. Mix all of the ingredients in a bowl to incorporate and dissolve the brown sugar. 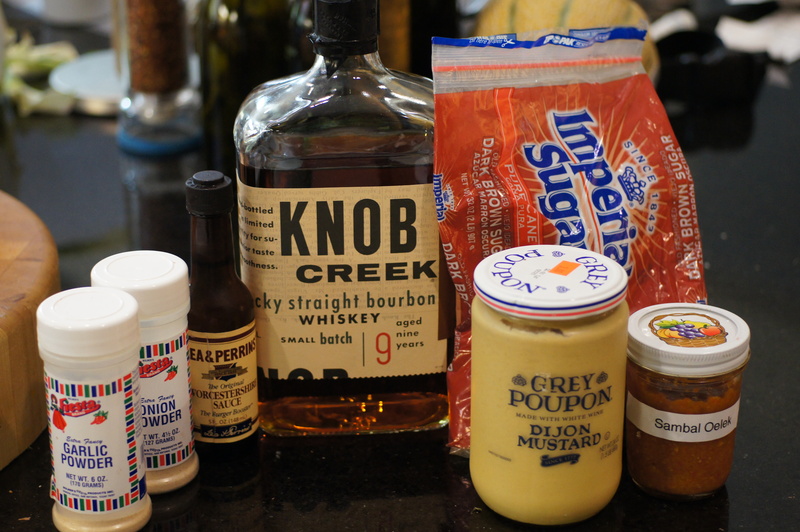 To insure the sugar dissolves, it’s best to add the bourbon first, then the sugar and mix. Next, add the remainder of the ingredients and incorporate. 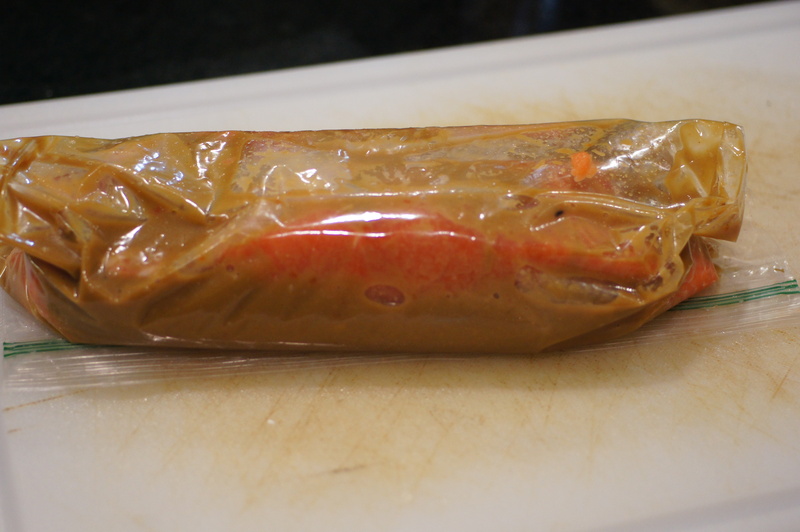 Place the salmon filets in a 1 gallon ziplock bag, cover with the glaze, (reserving 1/2 cup for basting, if you so desire) and seal. Put the salmon in the fridge for 30 minutes to marinate. Remove salmon from fridge. Add 2 Tbsp canola oil to a heavy skillet and heat over high heat until it shimmers. 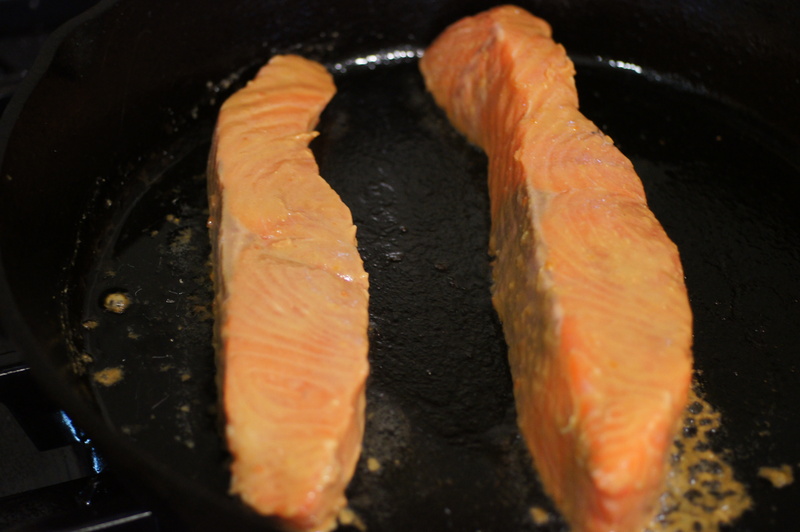 Add the marinated salmon filets to the skillet and immediately drop the heat to medium/medium high as you don’t want the sugars in the glaze to burn and become bitter. 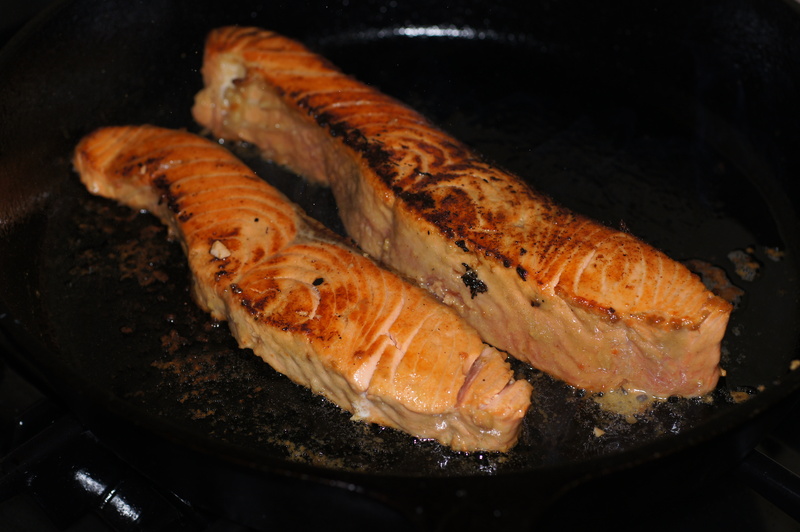 Depending upon the thickness of your filets and how done you like your salmon, cooking time will vary. The filet on the left was roughly 7 oz and 3/4 inch thick. It cooked 4 minutes on this side. The filet on the right was 14 oz and roughly 1-1/4 inch thick (Baby Lady and I split this filet). It cooked 6 minutes on this side before I flipped it. Notice the nice crust formed by the glaze. Now, if your prone to add additional glaze, this is the time to brush the filets with the reserved bourbon glaze. For the smaller filet, cooking time was roughly another 4 minutes on this side. When plated it was a perfect medium, the way Quickstep likes his salmon. 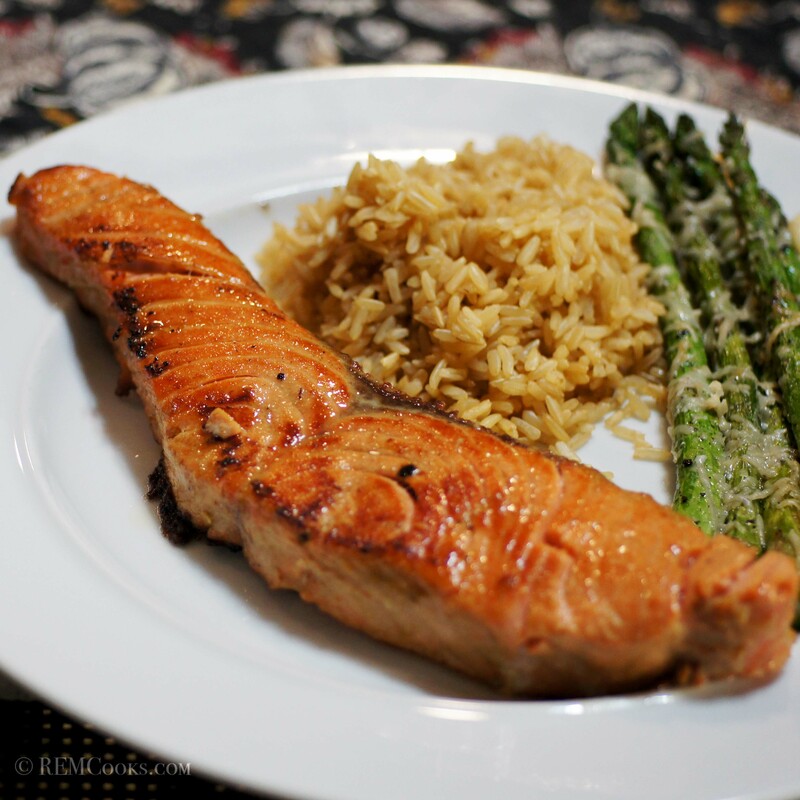 If you like your salmon completely done, then cook roughly 5 – 6 minutes per side. With the larger piece, I turned it over to the skin side (skin was removed) and allowed it to cook another 3 minutes. When plated, it was a perfect medium rare, just the way Baby Lady and I like our salmon. If you have a piece this thich and want it well done, cook an additional 2 – 3 minutes on each side. While the salmon is marinating, preheat an oven to 325 F. Oil a baking sheet and line the sheet with the asparagus spears in a single layer. Lightly season with salt and pepper and shake baking sheet to coat the asparagus with oil. Repeat seasoning to taste. Place the asparagus in the oven for 20 minutes. After 20 minutes, remove the asparagus and top with grated parmesan cheese. Return to oven and cook an additional 8 – 10 minutes to melt the parmesan and finish roasting the asparagus. Place a salmon filet on each plate and brush with additional glaze if so desired. Serve some asparagus on the side and enjoy! NOTES: You can also make this dish over a grill. If you do so, I would suggest you get a fish grilling rack. Also, basting the fish will be an absolutely necessity if cooked over a grill and be careful not to allow the heat to get high enough to burn the sugars. Grilling will add a nice depth of flavor to this dish. Ha! The problem with having Ming cook my dinner once is that it’s really hard to go back to my own kitchen. What a great plate! That salmon loks absolutely perfect. A great tip, too, about cooking the salmon on too high a flame. Who wants a bitter glaze?